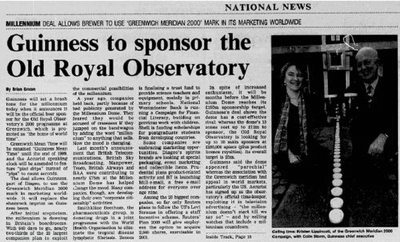 March 31, 1998: An article in the Financial Times detailed an agreement that had been struck between the Old Royal Observatory in Greenwich, England and the Guinness brewery, wherein Guinness would be declared the official beer sponsor of the Observatory's millennium celebration. Greenwich Mean Time would be renamed Guinness Mean Time, and instead of counting seconds in "pips," as was traditional, the Observatory would count them in "pint drips." The Financial Times lamented that the deal marked a new low in corporate marketing and set a "brash tone for the millennium." But what the Financial Times didn't realize was that it had fallen for a joke. The Guinness press release, from which it had taken the information, had been marked for April 1 release. The Financial Times subsequently published a curt retraction, clarifying that Guinness Mean Time had been "apparently intended as part of an April 1 spoof." Much of the April 1, 1981 issue of The Guardian was given over to discussion of an exciting scientific breakthrough. Scientists at Britain's research labs in Pershore had developed a machine to control the weather within a 5000-kilometer radius. This was good news for the British, who were to be guaranteed long summers with rainfall only at night, but it turned out to be somewhat less good news for the rest of Europe, who would be stuck with "whatever Pershore decides to send it." One photo showed Prof. Max Chisholm-Downright, inventor of the weather machine, expressing "quiet satisfaction as a computer printout announced sunshine in Pershore and a forthcoming blizzard over Marseilles." Readers were assured that the machine would produce only minor side effects, such as a "ten or twelve-foot rise in mean sea level." 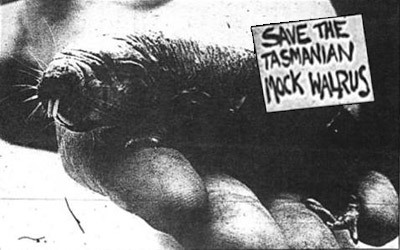 April 1, 1984: The Orlando Sentinel featured a story about a creature known as the Tasmanian Mock Walrus (or TMW for short) that many people in Florida were said to be adopting as a pet. The creature was four inches long, resembled a walrus, purred like a cat, and had the temperament of a hamster. What made it such an ideal pet was that it never had to be bathed, used a litter box, and ate cockroaches. In fact, a single TMW could entirely rid a house of its cockroach problem. However, the local pest-control industry was said to be pressuring the government to ban TMWs, fearing they would put cockroach exterminators out of business. Dozens of people called the paper trying to find out where they could obtain their own TMW. Skeptics noted that the photo of a TMW accompanying the article showed a creature that looked suspiciously similar to a Naked Mole Rat. 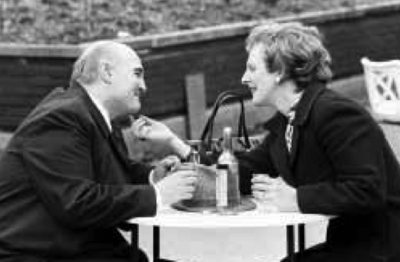 April 1, 1987: The Daily Mirror broke the news of a romance that had blossomed between Margaret Thatcher and Mikhail Gorbachev during Thatcher's tour of the Soviet Union. It accompanied this revelation with photos of the two world leaders sitting together in Moscow's Gorky Park. In one photo, Thatcher could be seen tenderly tickling Gorbachev under his chin. In another, the two walked arm in arm and even sneaked a kiss. The photos were posed by lookalikes, but they succeeded in fooling thousands. Many expressed shock that Thatcher, a married woman, would act in such a way in public. In real life, Thatcher left Moscow on April 2, 1987. She told members of the press that she and Gorbachev "got on very well, considering that we are very different and hold very different views." 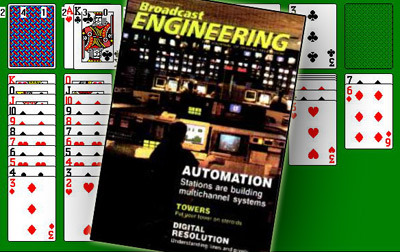 The April 1998 cover of Broadcast Engineering showed a view of the media control room of TCI (Tele-Communications Inc. — at the time the largest U.S. cable provider. Later acquired by AT&T and then Comcast.) The cover sparked a massive reader response, with hundreds of letters sent to the magazine pointing out what appeared to be an unintentional goof: the game Solitaire could clearly be seen on the computer screen of the employee in the foreground. Evidently the man had been caught red-handed not doing his job. Not so, the editors revealed in the next issue. The solitaire-playing employee was an intentional (but very believable) joke, created with the participation of TCI's engineering staff. April 1, 2009: The Swiss Tourism Board released a video that revealed the secret of why their mountains look so clean. It was due to the hard work of the Association of Swiss Mountain Cleaners, whose members daily scaled the Alps, scrubbing the rocks of unsightly bird droppings. The cleaning not only maintained the beauty of the Alps, but also prevented the droppings from eating away at the rocks, causing cavities that might eventually lead to the complete erosion and disappearance of the mountains. Millions of people watched the video, and 30,000 took the online test to determine whether they had what it took to become a mountain cleaner (aka "Felsenputzer"). Later that year, due to popular demand, the Brunni cable car company began offering an actual mountain cleaning course that attracted would-be Felsenputzers from around the world. April 1, 1995: Spoofing the increasingly complex regulations mandated by the European Economic Community, Polo Mints ("the mint with a hole") ran ads in British papers announcing that "in accordance with EEC Council Regulation (EC) 631/95" they would no longer be producing mints with holes. This regulation supposedly required that all producers of "tubular foodstuffs" delete the holes from their products. To satisfy the regulation, all the existing stock of Polo mints would be supplemented with a "EURO-CONVERSION KIT" containing twenty 7mm "Hole Fillers" to be placed inside each Polo mint. A "detailed instruction leaflet" would also be included. 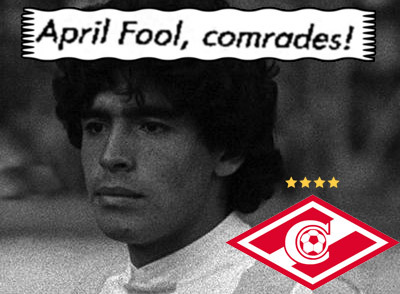 April 1, 1988: The Soviet newspaper Izvestia reported that the world-renowned Argentine soccer star Diego Maradona was in negotiations to join Spartak Moscow, who were to pay him $6 million to play on their struggling team. The Associated Press quickly picked up this surprising story and distributed it to their subscribers, but had to publish a retraction after querying Izvestia for more details and receiving the response that they should be mindful of the date (April 1st). The AP had believed the story because Soviet papers had never before published an April Fool's Day hoax. It was simply unheard of for the dour, state-run publications to crack a joke. The sudden display of humor was credited to Mikhail Gorbachev's policy of glasnost, or openness, instituted the previous year. April 1, 1996: Virgin Cola ran an ad in British papers announcing that in the interest of consumer safety it had integrated a new technology into its cans. When the cola passed its sell-by date, the liquid reacted with the metal in the can, turning the can bright blue. 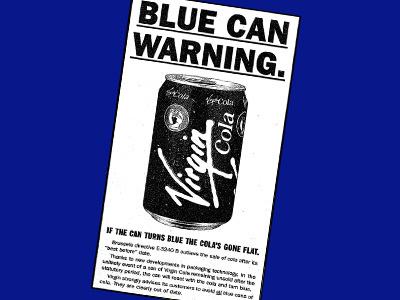 Virgin warned that consumers should therefore avoid purchasing all blue cans. Coincidentally, Pepsi had recently unveiled its newly designed cans which were bright blue. 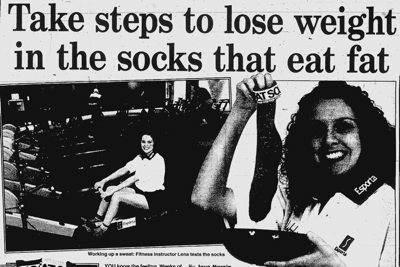 April 1, 2000: The Daily Mail revealed that Esporta Health Clubs had launched a new line of socks, dubbed FatSox, designed to help people lose weight. These revolutionary socks actually sucked body fat out of sweating feet, promising to "banish fat for ever." The American inventor of this weight-loss product, Professor Frank Ellis Elgood, explained that the socks employed a nylon polymer called FloraAstraTetrazine "previously only applied in the nutrition industry." As a person's body heat rose and their blood vessels dilated, the socks drew "excess lipid from the body through the sweat." After having sweated out the fat, the wearer could then simply wash the socks, and the fat, away.